Fisher Shipping has been helping companies with their commercial fleet transport needs since opening in 2006. We have moved thousands of vehicles for some of the largest companies, upfitters, and manufacturers in the United States. Our systems and process give us the ability to move hundreds of your vehicles in a very short amount of time. We can help transport your fleet of vehicles from one location to another, or help disperse new units to specific locations or job sites. When it’s time to move your commercial vehicle fleet, work with the best. If you’re ready for a free quote on your next fleet move, give us a call at 1 (888) 886-3456. The best way to reach your agent during business hours (Mon-Fri 9-5 EST) is by calling our office at 1 (888) 886-3456. During business hours, you will always get to speak to a person – not voicemail. After 5pm, one of our after-hours agents will be able to contact your agent in the event of a time sensitive issue. Fisher Shipping gives you a dedicated agent that will be your lone point of contact. This agent will know your fleet’s details, points of contact at all your locations, and your expectations are for turnaround time and communication. Whether you have a fleet of 1 or 500 it’s no problem! We can handle it all. We have a top notch network of reliable transporters available that allows us to move hundreds of vehicles at a time to any location in the United States. If it’s just one vehicle, we will treat the job with the same degree of importance. Not only is Fisher Shipping “A+” rated with the Better Business Bureau, but check out our feedback on sites like Google & Yelp. You can also look at what some of our fleet customers have to say about us below and on our testimonials page. Commercial vehicle fleet transportation is sometimes urgent. We know you have deadlines. 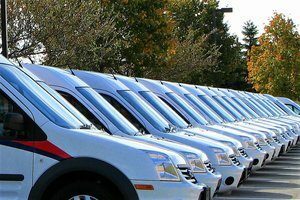 Our goal is to move your fleet vehicles from point A to point B in the exact timeline you expect. In some cases, we are able to pick up vehicles the same day that you call us. Expedited service does generally cost more, but it’s available if that’s what you need. Fisher Shipping is our first choice when the need arises to transport a vehicle for one of our lease customers. The thing that differentiates their service from other shipping companies is the level of communication we receive, from quickly getting quotes to setting up and confirming pickups and deliveries, being kept advised of any problems along the way, and confirming delivery. Fisher also has a great network of truckers. They set high standards and hold them accountable. All of this and they are easy to work with. I highly recommend Fisher Shipping. I would like to convey my experience with Fisher Shipping Company, and Cecelia in particular. We sell wheelchair accessible vehicles at 15 stores located in 6 states. Our stores range from Champaign, IL in the east to Albuquerque, NM in the west. Fisher Shipping Company has been our trusted transportation partner in each new market we enter. As we expand into new markets, we can be confident that Fisher will help us solve the logistics challenges associated with this growth. Cecelia promptly responds to all requests and excels in communication with each load. Cecelia has answered emails and calls after hours, as well as on the weekend to ensure excellent service. Due to the nature of our business (modified vehicles), we have had occasion for specialty equipment. Fisher Shipping Company has the resources and access to the diverse equipment needed to meet all of our requests. Partnering with Fisher has saved me time, energy, and worry, which I can invest into other aspects of my job. I recommend the use of Fisher to any business decision maker in charge of transport; you will be very happy with the results. Next time you are transporting a fleet of vehicles, or just one to a specific location or job site, we hope that you’ll consider us. Call today and join thousands of customers across the United States that have chosen Fisher Shipping as their preferred commercial fleet transporter.